Remember the candy apples I made that were so hard I was sure they would still be around for a lovely centerpiece for the Holidays? Well...they got kinda gooey, slimy, and I really feared the ants coming back so I tossed them. I would also like to add that the coating that was left on the plate had to soak in super hot water for more than 20 minutes to get it off the plate. Won't do those again. We are going to the in-laws for Thanksgiving. My usual gift (anywhere else I would go for a meal) is a bottle of wine (of course) but the in-laws not only don't drink, they really would prefer no one else does either (although on a couple Thanksgiving's Hubby has brought a bottle along anyway). So I thought a nice "Thank You" would be some Thanksgiving flowers. Everyone loves flowers, and I thought I would pick one out that could also be used as a centerpiece. My MIL always goes all out with the dressing of her tables. She will bring out the Pilgrim salt and pepper shakers, the Turkey napkin rings, the festive plates and decorative napkins. 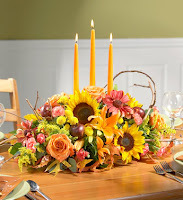 With her fancy table cloth and colorful runner, I thought this piece would look lovely.